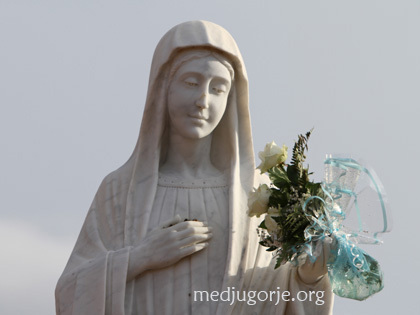 “Medjugorje is again in the center of attention, church and public as well. Though the visit of Cardinal Shonborn is private, it did not leave anybody indifferent because he is a member of Congregation for Doctrine of Faith. We talked to Cardinal while he was visiting Medjugorje. “We cannot deny that pilgrims have been coming over here for past 20 years, as we can not deny what they experience in Medjugorje and how close they feel to the Blessed Mother. This is my first visit, but since I’ve been a Bishop from 1991. I have noticed the fruits of Medjugorje. “I will give you couple of examples: vocations calls for priesthood. Lots of our young priests have received their vocation call here, but not strictly in Medjugorje but because of Medjugorje. The second thing are conversions. I am impressed that that happens in every level of society, from noble families, industrials down to the common little people. Flying from Vienna, via Zagreb to Split I was asked by security guard where I was going and I told him I was going to Medjugorje. All of Sudden his face started shining and he told me that he had his conversion in Medjugorje as well. Couple of weeks ago on one small railway station one worker told me his story. His wife died of cancer and he was desperate and his friends brought him to Medjugorje. He has received the strong and living faith over here. The third evidence are the healings. A young man who was addicted to drugs told me that he was almost forced by his friends over here. He told me while the bus was entering Medjugorje something happened with him. Especially he was healed immediately and all of us know how long that healing lasts. “The concrete ways of pilgrimages have been over here and that is a practical challenge for the church. That’s why the bishops from ex Yugoslavia said in 1991. that the official pilgrimages shouldn’t exist. I do not want and I cannot organize official pilgrimages to Medjugorje in my diocese as we did to Rome or Holy Land. But the Bishops Conference or Rome have never forbidden pilgrims to come to Medjugorje which is the main part of the third statement. “There are 3 elements which are connected with this phenomenon. Almost always Our Lady appears to children. Those were not especially intelligent children or holy children but normal. Bernadette did not know how to write. She was 14 almost as children over here. Secondly, Mary gives the messages through the children. It is insulting for one bishop. Why does Our Lady not come to the bishop’s house? Why does she come to a hill filled with stones or by the river? This is not practical. In Fatima she appeared in the bushes. She gives the messages through children because children are not complicated. The third element: it looks like Our Lady has her own program. In Fatima she had appeared before Russian Revolution and she gave a message. When rationalism was on its highest level she appeared in Lourdes. She appeared in Yugoslavia in the moment when we did not have an idea that Yugoslavia would fall apart in the time when the Catholics, Muslims and orthodox were living together. She appears with the name Queen of Peace. 10 years after that the first of 4 wars on Balkan Peninsula brakes out. And her first message was peace through conversion, prayer and this first message has its weight, strength, credibility. Maybe we could go further to Guadalupe, Mexico. When Europe started invasion of America, Our Lady appeared to one Indian who had to go to his bishop to tell him what to do. I am a catholic and belief in my faith. I belief everything about Medjugorge and I pray that every person will come to accept the peace Our Lady Queen OF PEACE is giving to help them forgive themself and love themself and the world. I visited Medjugorje in 2008, I felt invited and accepted I saw true belivers and I want to return to be present as Our Lady is calling us. I want to be there I want to be with Jesus and Mary. I love the article I read, I know it is true. I am a Franciscan Brother from India belong to a congregation of brotherhood in the third order of Saint Francis, you will get our information if you go through our website. At present I am in Bangalore doing my study on formative spirituality and counseling for two years and it is getting over this month of March. Now I am going to look after aspirants by next month. From the moment I joined the congregation my only aim is to attain perfection, to become a great saint and this made to have a special devotion to the Blessed Sacrament and Mother Mary. I love Jesus and Mother Mary very much and therefore I want to know what Mother Mary is communicating through her apparitions. I was reading about Our Lady of Medjugorje, Marian apparitions in many different places in the world and collecting its messages. I felt tremendous joy after reading messages of Mother Mary of Medjugorje, I do believe Medjugorje message and it helped me to pray even more than before. I have already started Praying for the success of Medjugorje as well. I have never seen Medjugorje and nobody told me about it and it was totally unknown to me till February 22, 2010. I have read Many criticisms against Medjugorje as well as supporting messages to Medjugorje, now my interior tells that Medjugorje apparition is true. The spiritual director of St. Faustina tells that the work of God is marked by sufferings and challenges and it is always true we find it in the lives of saints, I don’t know any saint without suffering. Many saints received messages from God and that messages contain a special mission too. Because of these they had to suffer, for example our seraphic father St. Francis of Assisi received a message from God to repair the Church, because of this message St. Francis had to reduce himself to a beggar. Greater the message greater is the suffering! I hear all the visionaries of Medjugorje and those who are associated with them have been suffering from the beginning to till now and it is continuing. This is actually a great sign that this Medjugorje event is a great work of God. Actually suffering for God is a very great privilege and I personally feel to share this suffering of Medjugorje. Now I am planning and preparing to lead a Marian movement in North East India like Fr. Stefano Gobbi. Please do help me with your prayer. I love Jesus and Mother Mary very much and therefore I wanted to know what Mother Mary is communicating through her apparitions. I was reading about Our Lady of Medjugorje, Marian apparitions in many different places in the world and collecting its’ messages. I felt tremendous joy after reading messages of Mother Mary of Medjugorje, I do believe Medjugorje message and it helped me to pray even more than before. I have already started praying for the success of Medjugorje as well. I have never seen Medjugorje and nobody told me about it and it was totally unknown to me till February 22, 2010. I have read many criticisms against Medjugorje as well as supporting messages to Medjugorje in the internet. Medjugorje apparition is true and I did not find anything wrong with the messages of Medjugorje. Mother Mary invites all of us to celebrate mass, to go for confession, to receive Eucharist and pray rosary everyday all these are very much part of the Catholic Church. I have been to medjugorje six times and have had differnt experience each time, though just as spirtualy fulfilling, but what amazes me is how six children from an atheistic communist run country had the courage stand their ground against their government police and some branches of their church untill their country is no longer under communist rule and 30 years later medjugorje has become a place where millions of pilgrims are witness to a benevelent christian spiritual experience brought about by the daily appiritions of our lady queen of peace which is still happening after all these years. Previous post: A transcript of Cardinal Schönborn’s homily at the Vigil Mass in Medjugorje celebrating the Solemnity of Mary, Mother of God.